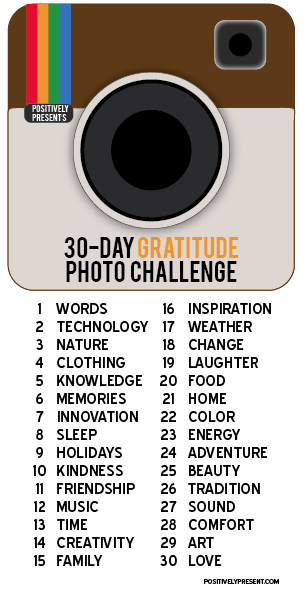 Last November my Aunt and our friend April all completed a 30-day gratitude photo challenge found on the blog Positively Present. Being that the various subjects related to what you were thankful for, it was a rewarding experience that got me in the Thanksgiving spirit and was a fun thing for us to share with each other. So this year another challenge has been posted and begins today, November 1st, however seeing as I have a lot of homework to do tonight I will begin posting my photos tomorrow. If you are interested in photography, being creative or a fun activity to do with friends this is definitely the challenge for you! You don’t need a fancy SLR to participate, a point and shoot or even a cell phone camera from which you can upload images onto Facebook or your own blog will work perfectly. I enjoy any opportunity to be creative outside the confines of a classroom, therefore I find things like this exciting and I hope that you will all join me in documenting what you have to be thankful for in your life this year! This entry was posted on November 2, 2012 by thelonotes in Uncategorized.